My author Debbie’s cat, Stripey, seems to enjoy using and being near computers. Check out this shot of him on a laptop and then watch videos about other cats and computers. Also, feel free to share photos of your own cats at the keyboard. I have a very interesting guest here today. What is your name and your author’s name, Mr. Cat? My name is Sylvester, a suitable name for a big cat like me, and my author is Joyce Ann Brown. Very mice to meet you, Psycho Cat, I mean Sylvester. CATastrophic Connections, FURtive Investigation, Nine LiFelines, and Tailed. All cozy mysteries. Concatulations! I’m going to be on my fourth book soon, too. My author just finished writing the first draft of it. Ha! I’m based on all cats that act psycho at times. (I’m told that’s most of them, not only my author’s cats, Moose and Chloe.) 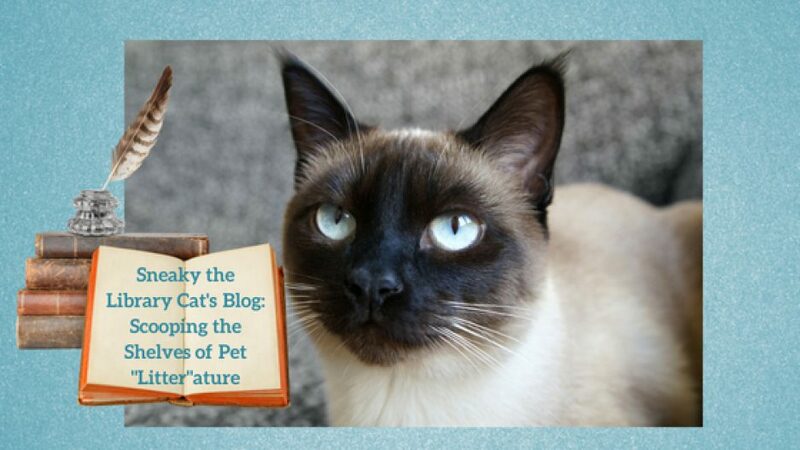 My author collects anecdotes about cats and lets me live them in her books. If you have any good cat stories, let Joyce Ann Brown know. I’ll get to do something new in our next book. What a pawsome opportunity. My author Debbie’s cat, Stripey, is definitely a psycho cat at times. I also have my moments especially when Alicia or Laura at the library give me catnip. This is from Tailed when Beth and her husband, Arnie, are on an RV trip with Beth’s sister, Meg, and her husband. Psycho Cat is traveling with Beth and Weeny the dog is with Meg. Suspect forces are at work, but no one in the party is ready to accept what they can’t prove. Beth and Arnie are sitting on the bed in the RV. “If anyone tried to break-in while Psycho Cat was here, before Meg got him, he would’ve been up to his old tricks and scared the intruder away,” Beth said. Arnie stopped petting, and Psycho Cat jumped off the bed, hissed at its wooden base, and prowled the perimeter. He ran to Beth’s feet, pawed her leg, and met her with a deep meow and a paw jab at the bedspread when she leaned over to calm him with a head rub. She leaned over and lifted the spread. “What’s the matter, are you still complaining that you were kidnapped away from your favorite napping place to spend the evening with Weeny? Everything’s alright now. We’re here. Come up with me.” She lifted the cat back up beside her on the bed and continued stroking his smooth yellow fur. Wow, Meow. That was a purrfect excerpt. I get to help solve murder mysteries by being myself. I meow and hiss and yowl and growl deep in my throat, but I don’t speak human. Who would want to? Those humans never understand each other, anyway – MOL (meow out loud). My favorite quote. That Twain guy was pretty wise for a human. The fourth Psycho Cat and the Landlady Mystery was released in February. Tailed is the book from which I took the excerpt above. Gil and Freddy, the two bumbling crooks who follow Beth and me, get their own mindboggling chapters in our latest adventure. Excellent. Way to go, Sylvester! You and your author sure are social. I notice you’re on Hometown Reads, too. So are my Cobble Cove books. Your author also has a few blogs. Debbie has her own, and I take care of this one. Thank you so much. That was a great video. I love videos. I even feature a cat-related film each Friday on this blog. Best whiskers to you and Joyce Ann Brown on your wonderful series. Sneaky here with another pawsome interview of a pet character. Today, it’s my pleasure to be cat chatting with a cozy mystery cat whose currrent book, The Marmalade Murders, is on tour with Escape with Dollycas Into a Good Book. Hello! My name is Harrison and my author is Elizabeth J. Duncan. I am the protagonist’s beautiful grey cat and I feature in the Penny Brannigan mystery series, set in North Wales. But, and this is a big BUT, I did not make a cover appearance until Slated for Death! You are quite a star to be in so many books. I, myself, did not appear on a Cobble Cove mystery cover until the third book of the series and then it was only a likeness of my Siamese self. I am sorry to tell you that my author is a dog person, and doesn’t have a cat. She doesn’t have a dog either, for that matter, at this time because she spends almost half her time out of the country. However, I am based on the cover artist’s cat. I see. Can you share an excerpt from one of your books that features you in an important scene? If so, please include it. This is the day my lucky author met me. In the kitchen, cuddled together in a towel-lined box in front of the Aga were a black-and-white cat and her kitten. The mother’s paws were wrapped in bright pink bandaging and the fur on her ears was gone, revealing raw, blistered skin. “I have to put cream on them twice a day,” Emyr said, bending over and scooping up her kitten. He placed the kitten in Penny’s arms. The kitten’s milky blue eyes tried to focus on her face and he meowed softly. Penny rubbed his round, downy head with her chin. His fur was a soft dove grey and his tiny paws were white, as was a small, roughly heart-shaped patch on his chest. “Oh, I don’t want to put him down,” Penny exclaimed, as the kitten nuzzled into her neck, his tiny, sharp claws catching on her jacket. What a great introduction. Thank you for sharing it. I like when the author uses me to end a chapter. It’s an important job. So true. My author likes to end each chapter with a mini cliffhanger so readers want to read more. I am a silent character who lets my character know when it is time for my dinner. I do much the same. Eating is a very important role for us character cats to play as real-life cats do much of it as well as sleep. Make sure they feature you on the cover. Excellent advice. I pushed my author into featuring me on Written in Stone, our third mystery, and also had her create this blog for me. The Marmalade Murders comes out April 24, but if you can believe it, it’s not me on the cover! It’s a little ginger cat. As well as you’re in it, that’s what counts. All cats make good cover models. I don’t “like” any pages, but I’m sure my author will follow her. She enjoys meeting other authors especially cozy mystery ones like her. Thanks for chatting with me, Harrison, and best whiskers to you and your author on your new release and blog tour. I’m not afraid of cucumbers, but it looks like my fellow felines are. Check out this video to see what I’m talking about, and maybe leave a cucumber out to test your own kitty.